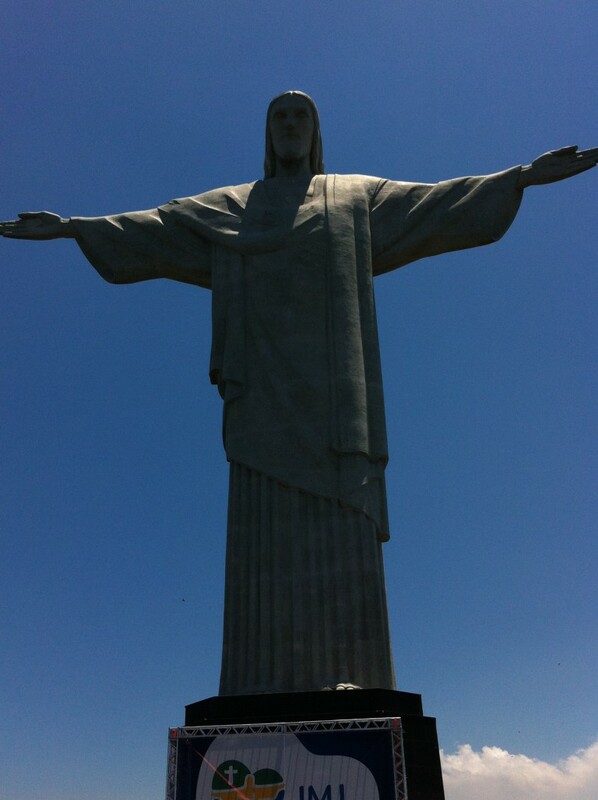 This post tells about a day of sightseeing in Rio de Janeiro. What sights should you see on your first day in Rio de Janeiro, Brazil? And what is Rio de Janeiro, the host of the 2016 Olympic Games like? Rio de Janeiro is a city with a really unique setting. Rio is both a lively city and a tropical resort and it has dramatic mountains and beaches at its very center. The city of Rio de Janeiro has a colonial past. It was first discovered by Europeans in January 1502. They thought the bay was a river and that’s why they gave the place a name that meant the river of January. Rio de Janeiro was the capital of Brazil until 1960 when the capital was moved to the newly-built city of Brasilia. Rio is home to 6 million people and additionally 8 million live in the suburbs. 14 million people on the narrow strip of land between mountains and the Atlantic Ocean of course means a total chaos in the city. People here don’t care about the traffic jams, they take it easy. Instead they love their city, the samba, the carnival and the beaches. This map shows our sightseeing itinerary in Rio de Janeiro. Rio in general: coming from the airport you pass the North Zone of the city with favelas. Most tourists stay in the South Zone with the wealthy neighborhoods of Copacabana and Ipanema. And so did we. The easiest way to get from the airport is by taxi. Rio de Janeiro has developed bus and metro networks but the buses can be a bit difficult to understand. The metro system is very clear and you can get to many places like to the city center from Copacabana. To see the main sights of Rio de Janeiro in one day we decided to take an organized sightseeing tour. We took a small-group minibus tour arranged by cariocas, the locals. The driver picked up all the passengers from their hotels and together we had a great day of sightseeing in Rio de Janeiro, Brazil! To avoid the morning rush the tour started early in the morning. We took side streets to Praia da Sao Conrado that is the next beach after Ipanema and Leblon (I will show photos of Ipanema at the end of this post). The Praia da Sao Conrado beach is a landing pad for hang gliders that take off from the nearby platform on the mountain of Pedra Bonita. Pedra Bonita looks like a sugar loaf but it’s not the “real” one. There were not many hang gliders around yet but much more delivery trucks bringing coconuts and other stuff to the beach cafes. From the Praia our sightseeing in Rio de Janeiro continued up the hill to a rainforest, Parque da Tijuca. The huge rainforest of Parque Nacional da Tijuca is right in the heart of the city. It’s the largest urban forest in the world. There are several regions that you can explore: nature trails, leisure and picnic areas, museums and restaurants, lookouts and waterfalls. The park has 200 species of tropical birds many of which are endangered. The walking trails are not well marked so you should go in a group.It’s easy to get lost in the thick tropical jungle. The park is easily accessible by car and there are many good roads so you can explore many parts of it on an organized tour. Parque da Tijuca draws crowds of locals at the weekend but it was a weekday and very silent. You could just hear the birds and the waterfalls. Christ the Redeemer stands on the top of the 706 m high Corcovado Mountain. The reason for creating this monument was to mark the centenary of Brazilian independence in 1931. The statue is 30 m high. It was built in Paris and shipped to Brazil in pieces. It was hauled up the mountain by rail. This all took years. You can reach the top by a funicular train or by a small bus along a narrow and winding road. The journey is spectacular and so is the panorama from the platform below the statue! I have to say the view is just as breathtaking as you could imagine from all the pictures you’ve seen on this famous landmark of Brazil. You have the whole city and all the sugar loafs, the right one and all the wrong ones right below you. The road down from Corcovado offered great views of favelas built on the side of the steep hills. Unfortunately our tour didn’t include a visit to one. There are approximately 800 favelas in Rio and 3 million people live in them, many of them originally from the poor areas of the countryside. The favelas were built illegally when worker families couldn’t afford living downtown. Today the standard in favelas is being raised. Favelas exist in every Brazilian city and they are kind of creative centers of the country. The Carnival of Rio wouldn’t exist without favelas. All the main samba schools come from different favelas. The next destination was Santa Teresa. Santa Teresa a picturesque hilltop neighborhood with charming architecture and pretty views to the city. Our tour stopped here and we walked around along the sloping cobblestone streets. Santa Teresa has artist shops, museums and nice cafes and restaurants, a really nice-looking area I’d want to learn more about on my next trip to Rio. To get to Santa Teresa from the city center you can take the historic tram that brings you directly here. The somewhat bohemian area of Lapa a short way from Santa Teresa is THE PLACE for Brazilian music in Rio de Janeiro. There are music clubs all over so you should definitely come here on Friday or Saturday night. We were here at daytime so it was not the music time – but there were the huge 18th century aqueduct Arcos da Lapa that was built to transport drinking water from Santa Teresa to the city, and Escadaria Selaron, the famous Lapa Steps. This is an artwork by the Chilean artist Jorge Selaron who decorated the 215 steps between Lapa and Santa Teresa with colorful tiles. Since 1990 he laid over 2000 tiles here from 60 countries in the world. He mainly used red-colored tiles but many people brought their own tiles and he added them. Selaron died in 2013. The Sugar Loaf Mountain is in fact two mountains at the end of Urca Bay. They are accessible by a cable car that first takes you to the first loaf that is lower, about 200 m, and then to the second peak that is 400 m above the Atlantic. The name comes from the mountain’s shape that looks like what it’s called. In Brazil sugar cane is one of the most common agricultural plants. There are trails running around the summit where you can see wildlife like birds and marmosets (a small monkey) but the main attraction here are the sweeping views in all four directions. There are bars and cafes on the top so we decided to leave the tour at this point and stay on the top for a while. It was late afternoon and clouds were gathering round the Sugar Loaf. Sometimes you could only see the white mist around you, and then in a minute the weather was all clear! We took a taxi back to Copacabana, not at the cable car entrance but at the cafe across the street like our driver had told us to do. He said the taxi from the cafe would cost half the price. You have to go the the beach to understand Rio de Janeiro. The beaches are the meeting place for all the residents, both rich and poor. The locals are called cariocas. They are relaxed and love to go out, and the beach is the first place where everybody goes. It’s a very practical habit in the tropical climate. The time we spent here the temperature was round 37 Celcius, for us almost too hot in the city but good on the beach. Even the tanned Brazilians of course need UV protection, depending on your skin type. There was a sign that told how strong protection sunbathers belonging to different racial groups need in today’s conditions. We sat in the shade and shared a coconut. It’s a very hygienic drink, you drink the milk with a straw. Copacabana is huge beach, it’s 5 km long and there is a wave-patterned beachfront promenade all the way. Most hotels are here but our hotel was on the next beach, the Ipanema beach. Ipanema is a far more residential area than Copacabana and like the next area Leblon it’s the most desirable area to live in Rio de Janeiro. And what is good Ipanema also is a more quiet and safe area than Copacabana to stay at and the beach is just amazing, even at night! There are lots of cozy restaurants in the side streets behind the beach. We enjoyed a delicious dinner among cariocas with samba rhythms before falling into bed after our full day of sightseeing in Rio de Janeiro. We felt tired, the day before we had traveled all the way from New Zealand across the Pacific Ocean and South America and we still felt a bit like being in the New Zealand time zone – and the next day we were to head to our next destination in Brazil. Have you been to Rio and what else would you recommend to all the visitors to Rio’s 2016 Olympics? Read about the Rio 2016 Olympics on the official site of the Olympics.